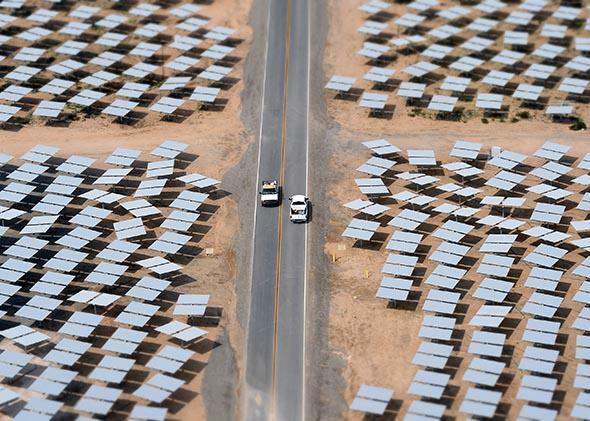 Apple, Kaiser Permanente solar investments: Renewable energy is finally a threat to coal. Vehicles travel on a road between rows of heliostats at the Ivanpah Solar Electric Generating System on March 3, 2014, in the Mojave Desert in California. Now we’re entering a new stage. Companies in sectors such as technology, health care, and consumer products—all big consumers of power—are striking deals to purchase huge amounts of renewable energy from newly constructed plants. This is different than companies putting up a solar array, or buying some carbon offsets, or making token greenness gestures. They are conjuring into existence new infrastructure that can’t help but replace coal. Take last week’s announcement that Apple will spend $850 million to purchase 130 megawatts of capacity from the First Solar California Flats Solar Project for 25 years. This is a step up for Apple, which had developed much smaller solar power plants in North Carolina and other states to power its data centers. As developer First Solar notes, this is the “industry’s largest commercial power deal.” Armed with an agreement from Apple, First Solar will build a 280 megawatt power plant on a large plot of land in Monterey County. It will sell nearly half the output to Apple and the rest to California utility Pacific Gas & Electric. Apple says the supply will be sufficient to run its stores and other operations in the state, allowing it to achieve carbon neutrality in California. On Feb. 12, Procter & Gamble announced a somewhat smaller deal with Constellation. The energy company will spend $200 million to build a biomass plant that will supply steam to a P&G plant in Albany, Georgia, that makes Charmin toilet paper and Bounty paper towels. That biomass plant, which creates energy by burning scrap wood, pecan shells, sawdust, and other natural materials, will have a capacity of 50 megawatts, and will supply electricity to both the factory and to a local utility. On Wednesday, Kaiser Permanente, the giant California-based health care company, signed a series of deals that, in aggregate, top Apple’s commitment. It hired NRG Energy to install solar panels on some 170 buildings and hospitals that will have a combined output of 70 megawatts. And it agreed to purchase 110 megawatts of electricity from a giant 485-megawatt solar plant under construction in California, as well as 43 megawatts of wind capacity from the Altamont Pass wind turbine farm. One of the earliest large-scale wind farms in the country, Altamont Pass is currently being refurbished—the owner is taking down several hundred old turbines and replacing them with a smaller number of new ones. Google, which already gets about 35 percent of its power from renewable sources, has also agreed to take 43 megawatts of capacity from the refurbished Altamont Pass plant. What gives? Yes, companies like to be green. And many executives, who are genuinely concerned about the future of the planet, are taking matters into their own hands. “We know that climate change is real,” as Apple CEO Tim Cook said when announcing the company’s deal. “Our view is that the time for talk has passed, and the time for action is now.” Kaiser Permanente noted in its release that these transactions and other measures it is undertaking would help reduce the company’s annual CO2 emissions by 23 percent. “What you’re seeing is that as energy prices move to the north, the cost of installation is going down and we’re delivering competitive energy,” says Erik Fogelberg, senior vice president of commercial sales at SolarCity, which has installed solar panels on 190 Walmart stores over the past several years, bringing the retailer’s cumulative generating capacity to about 65 megawatts. At corporations, the mentality has shifted from being willing to spend a little more money to use green power to viewing the shift to green power as a way to save money. In addition, renewable energy—for so long a flaky, small-scale enterprise—has developed into an industrial-strength solution that affords big companies the opportunity to lock in the cost of electricity over a period of 20 to 25 years. There are a lot of variables that may affect the price of power—new regulations might impose higher costs on coal-based energy, a carbon tax may be enacted, and so on. When companies strike long-term deals for solar or wind, they get a guarantee of price stability for a big portion of their supply over a long period of time. “It’s truly a hedge” against factors that can affect their operating costs, Fogelberg says. As I’ve noted before, when it comes to innovation in energy, procurement policy matters a great deal. Until now, it’s mostly been public entities—municipal governments, regional transportation agencies, the military—that have been helping to foster green technologies through their purchases. Now we’re starting to see private-sector companies do the same. And they’re a much more powerful force. Each of these new, large-scale transactions will displace and obviate the need for power produced from fossil fuels. The Fortune 500 is opening up a new front in the war on coal.